Ever since the winter temperatures finally started rising with the coming of spring, the quails have been demanding the completion of their promised new abode. Since I speak quail and Gene doesn’t, I happily translated their plaintive cries for non-garage condo space. Finally, this week was the great unveiling of the Quail Sanctuary. It’s 16 square feet of modern avian living, complete with a stunning park-like setting, living forage station, two bark installations for climbing and hiding, a dust bathing area, and a privacy nook in the back for napping and cuddling. The best part of the new Sanctuary is that Gene built it on the front porch, right up against the window – I can sit on my couch nest and watch the Quail Channel for hours. 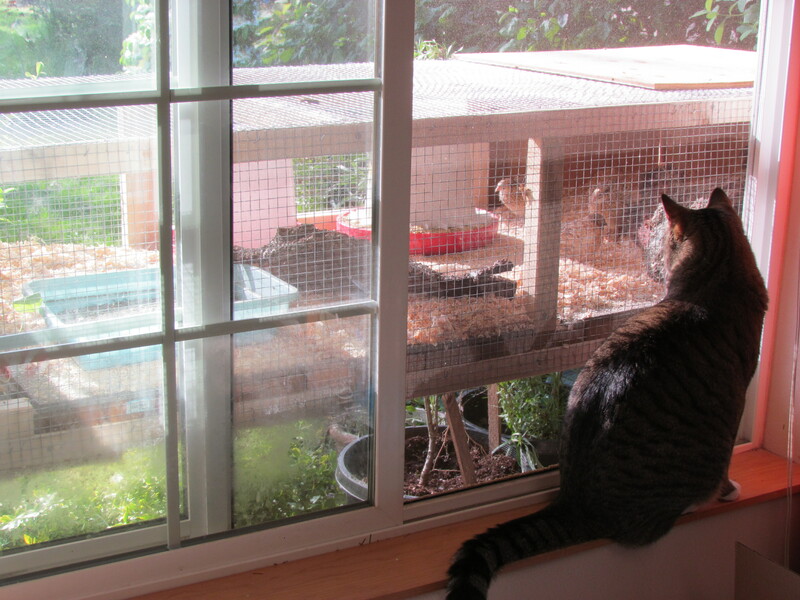 The cats are all thrilled, and spend the better part of their day perched on the window sill staring and meowing. They don’t bother the quails in the slightest, despite being mere inches away depending on where in the cage the birds decide to wander. 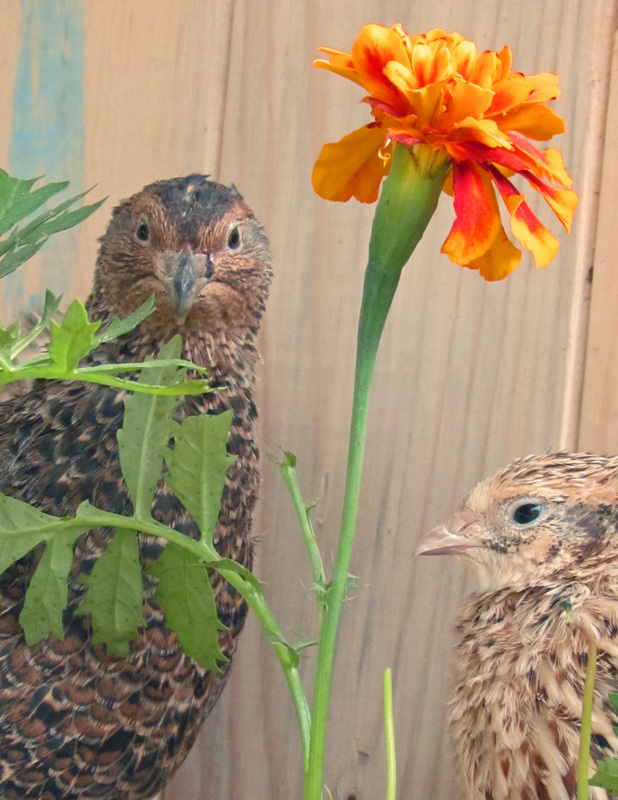 The quails seem to spend the bulk of their time happily scooting around in the dust bathing area, or snacking on marigolds and nasturtiums in the foraging nook. After seeing someone else add a dirt-filled frame with growing grass to their quail set-up, I pestered Gene until he let me add a sunken tray lined with heavy plastic to his design. I filled it with sand and gravel for drainage, then added a layer of soil and planted nasturtiums in it. 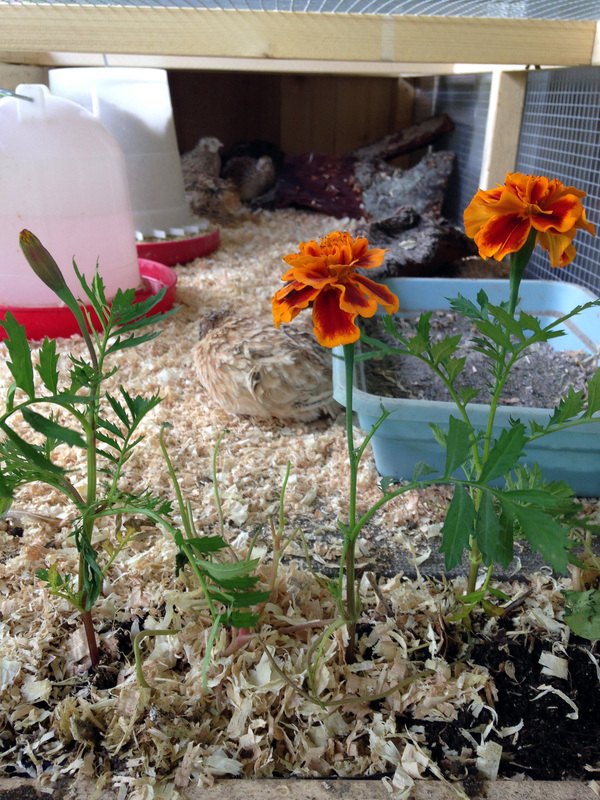 The quails put a beat down on the tasty fresh plants within minutes of being relocated into the Sanctuary, so I’ve already had to replace the chewed remnants with marigolds. I figure throughout the summer I can grow various quail delicacies and replant as needed. Not that they’re spoiled, or anything.